I was planning to go for a quick run along the river in the morning but with the reporting time set as early as seven in the morning, I found myself accompanying the kids to the buffet breakfast line instead. 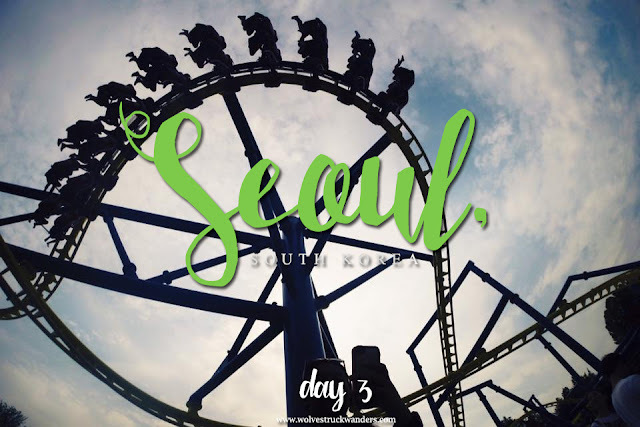 Day 3 was a pretty exciting because we got to visit the typical touristy places and learnt a whole lot about Korean culture and history. It is also my favorite day out of my entire stay because while the students were having rehearsals, I actually got the chance to explore Seoul on my own. First stop, was a visit to Namsangol Hanok Village which was the most accessible village, located around the Myeongdong area. Hanok is actually a term used to describe Korean houses. I find it absolutely interesting how so much planning and consideration are being put into the housing in Korea. The houses are being built and positioned in such a way that best fits its surroundings. For example, the ideal house is built with a mountain in the back and a river in the front. There is also this thing called the Ondol heated rock system, which is this super cool dual heating system used for most houses in South Korea that keeps the houses warm during cold winters but at the same time, has a wide front porch to keep the houses cool during hot summers. Lastly, houses differ according to region where in the colder regions, houses are built in a closed square form to retain heat better whereas in the central regions, houses are typically "L" shaped. The type of housing that you live in can also be classified according to class and social status. After exploring the whole place on my own (more of running up and down the slopes with my GoPole) we got called back up onto the bus and made our way down to the next destination - the amazingly huge Gyeongbok Palace. We were supposed to catch the Royal Guard Changing Ceremony at the palace gates but unfortunately, there was some movie filming going on and the whole place was cordoned off. The place still got me in awe, nonetheless. Built in 1395, the Gyeongbokgung Palace was the main royal palace of the Joseon dynasty and is the largest of the Five Grand Palaces built by them. 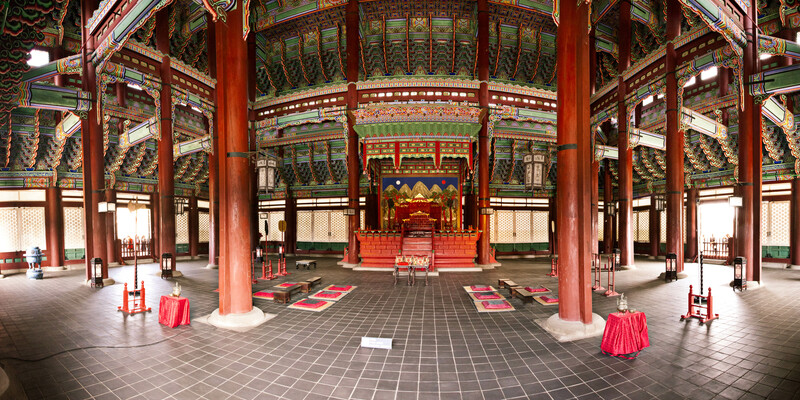 This was where the Kings, King's household, as well as the government of Joseon lived. All of the important people were here, which I believe was why this palace was burnt to the ground during the Japanese invasions of Korea and was left in ruins for the next three centuries. In 1989, the South Korean government started a 40-year initiative to rebuild the hundreds of structures that were destroyed by the Empire of Japan. The palace, when I visited, was already super huge so imagine my surprise when I got to know that what I saw was merely 40% completion of the structures that were standing before the Japanese invasion. Another 20 years, and the restoration project is looking to restore Gyeongbokgung palace to its former state. According to my tour guide Jennifer, these little "Japsang" decorative guardian figurines on the roof symbolizes the dignity and grandeur of a building, and also acts as shamanic symbols to chase away evil spirits and misfortune. There will always be either an eagle head or dragon head at the end, and only an odd number of figures can be placed on the roof. We spent almost two hours on the palace grounds and even that wasn't enough for me to explore the place fully. As I looked back to see the beautiful Mount Bugak as the palace's backdrop, I knew that I will come back here someday with my loved ones. Despite it being a tourist infested place, the view, culture and atmosphere is just too unique for me to explain in words and pictures. Lunch was extremely boring (for me) because everyone else had seafood while I had plain white rice with egg rolls. If you don't already know, I am allergic to seafood. The only thing that made lunch okay for me was the strawberry and original banana milk that I had along with my super dry meal. After lunch was done, I made sure the students got started with rehearsals before getting permission from my colleagues and clients to take a stroll around the area, and promised to be back before they were done with rehearsals. That meant that I had approximately three hours to explore this little gem right outside of the dance academy. I wrote a super detailed post about the place here - Explore : Children's Grand Park. Before heading back to the hotel, we made a pit stop to Dongdaemun - one of the biggest shopping districts in Seoul. The whole place was filled with wholesale items and street food, but I am rather cautious when it comes to street food unless there is a halal sign or the vendor is a Muslim, so all I got was the cheesy chicken balls. I wish I had more time to shop but then again, thirty minutes is good enough seeing how I am technically working. Dinner was held at this restaurant where everyone had to remove their shoes before entering, and then sit cross legged on little square mats on the floor while eating. It felt like I was having a tea party with my chubby gang.